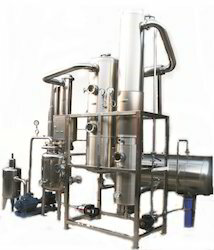 Offering you a complete choice of products which include mechanical vapour recompression plants. We are leading manufacturer, Importers and Service Provider of Mechanical Vapour Recompression and our product is made up of good quality. MVR is a Mechanical Vapour Recompression technology where the vapor is compressed in a compressor or fan to a higher temperature and pressure. This compressed vapour is then used an energy source instead of boiler steam. Evaporation is a thermal separation method dividing a feed flow of liquid into a condensate stream and a concentrate stream, the latter having a higher dry matter concentration than the feed stream. In most cases, the condensate will be very clean distilled water. The ECOVAP-MVR evaporators are characterized by an energy optimized design, compact layout, and high reliability. ECOVAP-MVR offered by us normally provides an energy saving in the range of 80-98%.